Super Audio Compact Discs (SACD) remains a niche market, but they – along with vinyl records – are the gold standard of audio reproduction for audiophiles. Vinyl records are treasured because of their warm, natural analog sound quality; SACDs are too, since they're the closest to analog sound in a digital format. However, a high-grade disc player is required to get the best sonic performance from SACDs. We tested the Onkyo C-S5VL SACD/CD player to find out how it delivers. 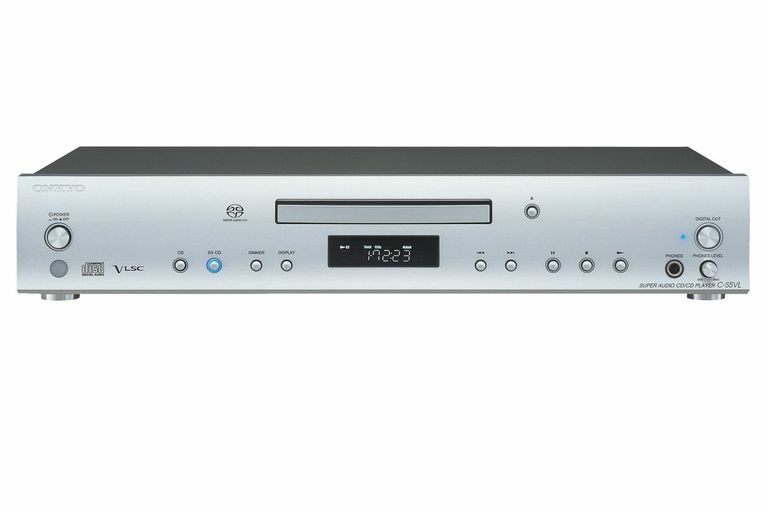 The C-S5VL is a two-channel SACD player and can play two-channel hybrid SACD/CD discs in addition to discs with MP3, WMA, and CD-R/RW music. Multi-channel SACD discs can also be played, but only the front left and front right channels will output from the player's analog and digital connections. The C-S5VL does not display SACD text information, but it does have a four-step dimmer to reduce potential audio interference from the lighted front panel display. The C-S5VL features optical and coaxial digital outputs, analog L/R channel outputs, a headphone jack with level control, and two RI (Remote Interactive) jacks so it can be controlled by other RI-capable, Onkyo-branded components via a wired remote control connection. The C-S5VL outputs its SACD signal through the analog and digital outputs, It's worth noting that the digital output is down-converted to PCM CD audio (44.1 kHz/16-bit) instead of SACD audio (2822.4 kHz/1-bit). SACD signals cannot be recorded via the digital outputs. The player has a switchable Digital Out control, which can be turned off to prevent digital noise from degrading analog playback quality. This SACD/CD player features Onkyo's proprietary VLSC (Vector Linear Shaping Circuitry) digital circuitry, which reduces digital pulse noise by correcting the output of the digital to analog converters in the amplifier. In addition to its 192 kHz/24-bit Burr-Brown DACs, it offers performance features such as five digital filters for PCM sources, four DSD digital filters, and signal "Phase" and "Area Priority" controls. The five PCM (Pulse Code Modulation) digital filters, which can be selected according to listening preferences, shape the frequency response characteristics when playing a CD. The four DSD (Direct Stream Digital) filters are used for SACD discs and also affect frequency response in the audible and inaudible ranges. The Phase control is used to invert the phase of the analog output (normal/inverse) and the Area Priority selects the default portion of a hybrid disc (SACD or CD) that you wish to listen to. We tested the Onkyo C-S5VL with the Onkyo A-5VL integrated amp and a pair of Focal 807V bookshelf speakers – a great sounding system altogether. We've enjoyed quite a few highlights from some of the best reference audio recordings. Music discs with male and female vocalists are among the best ways to evaluate an audio system. The vocalists in The World's Greatest Audiophile Vocal Recordings (Chesky Records, SACD) are great recordings, and the Onkyo player delivers a true sense of realism and musicality. Sibilance, the sounds often produced when the letter 's' is pronounced, sound crisp and precise along with the delicate treatment of high-frequency details. Laverne Butler's expressive and emotional track recording of "Isn't It a Pity" comes alive with a spacious soundstage that transcends well beyond the separation of the speakers. "The River Between" from Spyro Gyra's In Modern Times (SACD, Heads Up International) is rich with percussion instruments that express a shimmering and distinct sound quality. Each instrument is clearly separated with excellent articulation. Marta Gomez' "Cielito Lindo" from the same Chesky disc offers excellent mid and high-frequency detail. There is an especially clear reproduction of the rolling 'Rs' along with the subtle sounds of fingers on the solo guitar strings. Despite all these positive aspects of the Onkyo C-S5VL player, we're unconvinced about the sonic benefits of the selectable filters. The differences are subtle, and most listeners are apt to pick one and simply stick with it. The disc must be stopped and the menu accessed in order to change the filter selection, which makes comparison difficult and feels like a hassle. If you're shopping for a high-quality and affordable player to eke out the best performance from SACDs and CDs, look no further than the Onkyo C-S5VL. Its sound quality compares very favorably along with other disc players we reviewed – even some higher-end models.